Joseph Jackson is one of the men named on the Bottesford ‘church list’ of WW1 Servicemen. Joseph Jackson was born in Brant Broughton, Lincolnshire, on the 25th December, 1892. His parents were John Jackson and Mary Ann Jackson. John Jackson senior was born in Broughton Clays, close to Brant Broughton, in 1859. His mother was Mary A Jackson nee Ward, born in Peterborough in 1866. They were married on the 15th April, 1883, at Fletton, Peterborough. In 1891, the Jackson family was living on the High Street at Brant Broughton, Lincolnshire, where John Jackson was a brick maker. There were four children. The oldest was eight years old John Robert, born in Peterborough. Then came Thomas, aged 6, and Ruth, aged 4, both born in Allington, Lincolnshire, The youngest was Horace, aged two, who was born in Woodstone, Peterborough. In 1901, Joseph aged 8 lived with his parents at Stragglethorpe Brickyard, Lincolnshire. His father was still a brickmaker. The census displays some confusion about nearly everyone’s place of birth, but it is clear that there were now additional children: as well as John, Thomas and Horace, there was Joseph (aged 8), Ann (aged 6), Ruby (aged 2) and a 1 month old daughter, all were born in Stragglethorpe. Joseph Jackson came to Bottesford as a boy. However, it has not been possible to locate him in the 1911 census. He worked on the railway, and so might have been posted anywhere in the country. He was working at Bottesford Station from the 12th August, 1913, when he was aged 20 years old. His employer was the London and North Eastern Rail Company. 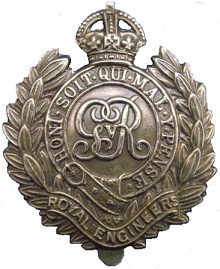 Few facts have been found, though it is known that he served in the Royal Engineers during WW1. There a number of memories of Joseph Jackson. He had been a steward at the British Legion Club in Albert Street, Bottesford. Before the Second World War, the village shop and post office in the nearby village of Allington was kept by Mrs Joe Jackson (wife of the station porter) at Post Office Farm. During WW2, an article in the Grantham Journal of February, 1946, noted that Mr Joseph Jackson of The Nook, Bottesford, had two sons who had joined up. They were both in the Royal Engineers. One, named Joseph Edward Jackson (after his father) served with Bomb Disposal units and the other, Corporal Denis Jackson, worked on construction projects. Before he joined up, Joseph Edward, known as Eddie, had worked for a local decorator, and he also worked as a painter and decorator for Cecil H Jallands in later years. Joseph Jackson died on 25th June 1959, aged 66. His obituary in the Grantham Journal stated that, as a British Railway employee, he had been presented with a gold watch three months previously to mark his forty five years of service. It added that his health had not been good for some time but he had continued to work until a few days before he entered hospital. His wife Florence Mary was born 28th May, 1894, and died on the 5th of December, 1979, age 85.